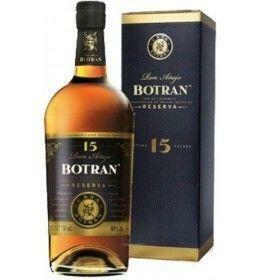 The Reserve 15 Years by Botran is a delicious blend of rum aged up to 15 years, distilled from sugarcane juice subjected to slow fermentation. Aged according to the Solera System at 2,400 meters above sea level in oak barrels, original first and medium toasted then, which contained aged Whiskey and Sherry; the Reserva is left to rest in Porto barrels. THE RHUM The Reserve 15 Years by Botran is a delicious blend of rum aged up to 15 years, distilled from sugarcane juice subjected to slow fermentation. Ron Añejo Botran Reserva is aged according to the Solera System at 2,400 meters above sea level in oak barrels, original first and medium toasted then, which previously contained American Whiskey and aged Sherry wines; finally Botran Reserva is left to rest in barrels that have matured Porto. THE DISTILLERY The Botran family is commonly known for sugarcane production in Guatemala, but in 1939 they decided to begin a journey by establishing Industria Licorera Quetzalteca. The five brothers agreed that the ultimate place to age rum in Guatemala was Quetzaltenango. Since that day they have been involved in all the details regarding their rum production. Although the nurturing process has evolved, it all began with the nurturing process called “Sistema Solera.” This process implies the integration of young and old rums, as they mellow for years in white oak barrels. They are the first family that produced Guatemalan rum, nowadays they continue producing one of the world’s finest quality rums. Solera 1893 and Reserva high quality rums have won many worldwide awards for their intricacy, profundity and signature sweet flavor. Tasting Color: mahogany. Bouquet: complex and expressive, with evident presence of toasted wood and a light aroma of vanilla. Spicy aromas. Taste: seductive and intense. In perfect balance with the woody notes that derive from the barrels. 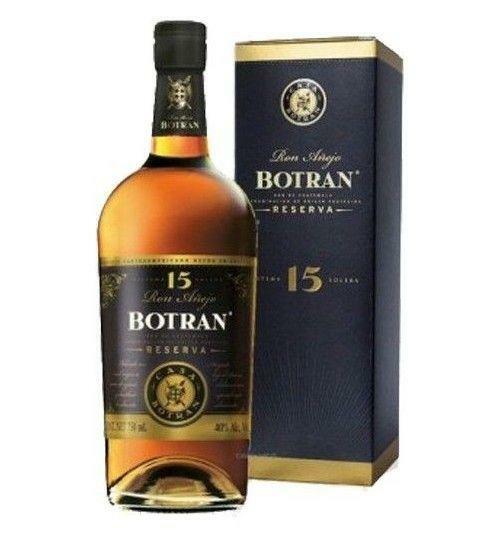 Service temperature 14° - 16° C.
The Reserve 15 Years by Botran is a delicious blend of rum aged up to 15 years, distilled from sugarcane juice subjected to slow fermentation. 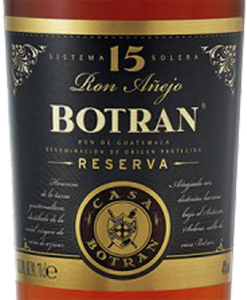 Ron Añejo Botran Reserva is aged according to the Solera System at 2,400 meters above sea level in oak barrels, original first and medium toasted then, which previously contained American Whiskey and aged Sherry wines; finally Botran Reserva is left to rest in barrels that have matured Porto.